Some time ago we decided to give beekeeping a try. We have always been environmentally minded, and are very aware of the plight of the bees in our area as well as the globe in general. Our property is certifed by the National Wildlife Federation as a certified Wildlife Habitat. We have pledged to help the wildlife by providing a friendly place for them. We have many bird houses, feeders, etc. We also do not use chemicals on the lawn which are responsible for a lot of ecological problems. 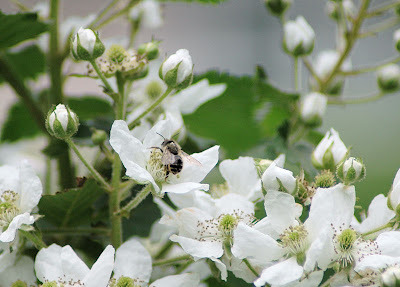 I confess to being a little leery of handling the bees at first, but once they were set up, I saw how gentle they were, and how easy it was to manage them. It is amazing how attached you can get to these gentle creatures! Our property is 1.27 wooded acres, and we are bordered on one side by an old abandoned cemetery. There is plenty of room, and the bees are located deep in the woods, and are certainly not a problem to anyone. Yesterday we discovered that someone trashed the hives! We figure they came through the cemetery to get at them. The hive that was the smallest, was completely trashed. They took rocks from the stone wall and threw them at the hives until they knocked them over! The first hive was completely opened and exposed to the elements. We don't think the queen survived. They can make another queen if they have brood (eggs), but that was all exposed and surely died. (The hive must maintain a constant 98.6 degrees to sustain life, an interesting parallel to humans). The next hive was only partially turned over, so we are hoping the queen survived. Only time will tell. The third hive fared the best. That one has marks on it from where they threw the rocks, but is pretty much intact. We figure that the bees were swarming by the time they were approaching the third one. On the weekend, Keith is going to move them to another location. He feels certain that whoever did this will return to try again. As long as I live, I will never understand this behavior! As Keith says, this is the price we pay for living in suburbia, where most people have no true connection to the land, no appreciation for nature or private property! All they seem to care about is their chemically manufactured lawns and their property values! It is not bad enough that the bees are facing colony collapse syndrome, no, they also have to put up with idiots who have to destroy what they do not understand! Unfortunately we did not take pictures of the damage. Keith wanted to get the hives back together as quickly as possible, and did not stop to take pictures. It was a pretty ugly sight! Here is a picture of the hives in the early Spring when they were first set up. Here is one of the little guys on a blackberry bush. I don't know if "karma" is a real thing or not, but if it is, I really hope the creeps who did this, get what is coming to them! How shameful! What goes through some people's minds, I'll never know. Clearly ignorance isn't always blissful. What a wonderful project you've started, I recently read that the bee population is on the decline. How wonderful that you two are doing your part to help the bees and environment. Oh no! I can't believe the mentality of people who think it is OK to do this kind of thing. I certainly home karma comes knocking on their door! I hope the bees survive - please update on their progress. Oops, that should obviously have been "HOPE karma comes knocking on their door"
that was uncalled for and I hope that they did get stung. As a honey lover, I am watching the whole situation with bees very carefully. I applaud you and your husband for doing something about it. I wish I had more than a postage stamp of a yard at my townhouse. I might try to do the same. On another topic, you are the winner of my Rabbit Rondel giveaway. Send a snail mail address to regmaracc@optonline.net to eeive your chart. The third to the last word in my post should be receive ... our new computer has a black keyboard and I need to get better lighting at the computer table in order to see what I am doing. What a completely incomprehensible dead. Like all sorts of vandalism. Quite obviously there are people out there who are able to turn off their brains. I hope you could save at least the two of the hives that were the least destroyed. What an awful thing for someone to do! It's not like the bees were bothering anybody - like you and the others, I hope karma catches up with whoever did this.